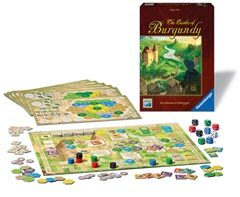 15th century princes from the Loire Valley devote their efforts to strategic trading and building in order to bring their estates to prosperity and prominence. Over the course of 5 rounds, collect the most points by trading, live stock farming, city building and scientific research to win! Stephan Feld has really come up with a gem of a game here (and he already has many!). The balance of how to approach your particular board, which tiles to prioritize, and when to push your advantage makes for many tough decisions. Great, great game!